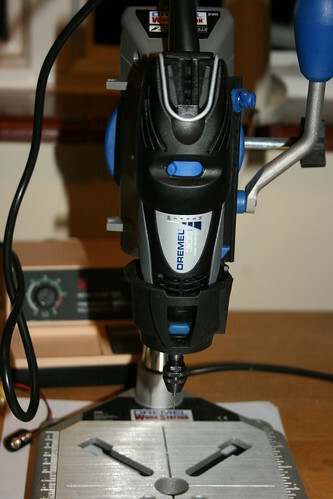 My first dremel arrived today (the 300), along with a drill press stand for it, a multichuck and some cutting disks. 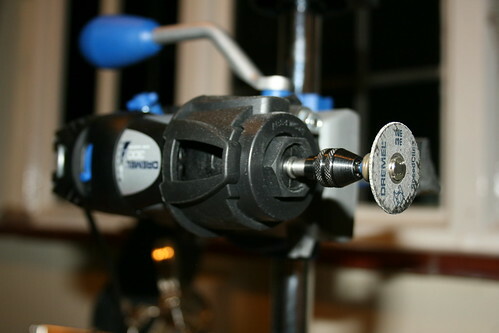 I had a quick go with it on some PCBs and it drills through them like a hot butter knife through butter: there's no resistance at all, the drill bit just eats right through the PCB. 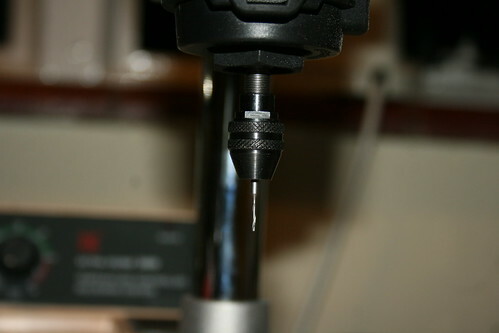 I'm using HSS drill bits and FR3 PCBs here, but I plan to get some tungsten carbide bits in the future. I then tried out the cutting disk, and it seems to evaporate the PCB material just about instantly! It makes really nice straight cuts, although takes out a fair bit of material in the process, and it's going to be a pain to cut around corners and such with it - it's kind of hard to get to since the edge of the cutting disk is above the bottom of the dremel. However, I think a bit of ingenuity with angles should work around that problem. At the end of the day, it works very well for both cutting and especially drilling PCBs, so all I need now is a laser printer and I'll be fully set to make them at home!